Most of us, at one point or another, have blown our budgets. But if you find yourself running into this situation on a regular basis, it's time to figure out what's going wrong. 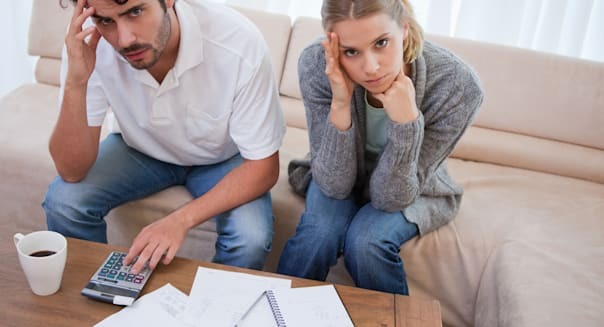 Chances are you've fallen into one (or more) of these six common budget traps. Here's how to identify your mistakes, and how to set them right. If you see your budget as an overbearing parent who won't allow you to do anything nice, it's no wonder you have trouble sticking to it. Yes, a budget is meant to put some limits on your spending, but that doesn't mean it should keep you from having any fun at all. Build in some treats for yourself, even if they're modest. You may not be able to afford to eat out at a posh restaurant every weekend, but maybe you can get takeout food on the occasional Friday night. Perhaps you can't spend $150 at the hair salon, but you can swing $30 at a nail salon. Maybe you decide you'll skip the bars for a month, in order to save enough money to get a new snowboard. Give yourself a break every now and then (within reason), and you'll find it much easier to be disciplined on the whole. Setting goals is great –- but don't shoot for something that's not within your grasp. Reducing your grocery bill to $150 per month (for a single person) is realistic; reducing it to $25 per month is not. Make sure your budget allows for all the reasonable expenses you can expect to incur throughout the month. Be realistic about how much money you'll comfortably need for non-negotiable expenses like groceries, heat and health care. You can make up the difference in other areas that are more discretionary, such as clothing and cable TV, but you need to be honest about what types of costs you're working with. You've remembered to budget for your monthly bills, but what about bills that are due quarterly or annually, such as your water bill, car registration renewal, holiday travel, summer camp fees, dentist co-pays,or birthday gifts for your children? Find a spot for these items in your budget by dividing your annual costs by 12, then putting aside that amount each month. If you spend $300 each year on a flight to your grandma's house for Thanksgiving, for example, set aside $25 per month into a "Thanksgiving airfare" fund. This is by far the easiest way to set your budget off-course -- and it isn't limited solely to shopping sprees. You can also commit an impulse purchase by grocery shopping without a list, giving into promotions that tempt you to buy things you don't need, and failing to compare prices or shop around for the best bargain. The problem with impulse purchases is that they're easy to rationalize. We find ways to convince ourselves that we either "need" an item, or that we're "saving money" by purchasing this item. Oreo cookies and Coca-Cola (KO) are luxuries, not necessities, even if they broadly fall under the category of "groceries." By redefining "necessity," you can avoid the rationalization that allows you to make an impulse purchase. Don't trick yourself into thinking that it's okay to make these impulse purchases at the store, under the guise that you're just spending on your "needs." Redefine "saving" to mean money that's still in your wallet – not the discount that we get by purchasing clearance items on impulse. Another big way people blow their budgets is by failing to plan for the unexpected. You may not be able to predict when you'll get sick or your car will start making odd noises, but you can anticipate that something unexpected is bound to happen sooner or later -- and you can set some money aside so you're prepared for it. Aim to build up an emergency savings fund of three to six months' worth of your income. Hopefully you'll never have to touch it, but if something unfortunate does befall you, you'll be able to handle it without incurring a financial hit. If you absolutely hate budgeting, you won't be likely to stick with it for long. Make sure you're using a system that feels user-friendly and is easy for you to understand. If you hate dealing with numbers, use budgeting software that does the math for you. If you can never keep track of your receipts, use a program that connects with your credit and debit cards and tracks your purchases automatically. Play to your strengths and work around your weaknesses and you'll find it much easier to stay on track. Paula Pant ditched her 9-to-5 job in 2008. She's traveled to 30 countries, owns six rental units and runs a business from her laptop. Her blog, Afford Anything, is a gathering spot for revolutionaries who understand that they can afford anything -- just not everything. Visit Afford Anything to learn how to shatter limits and live life on your own terms.